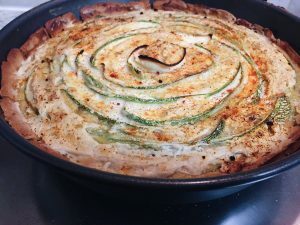 This is a warming delicious home favourite combining the sweetness of the slow and low onions and the beauty of the courgette with Raw Food Rosie’s Vampire Slayer Cream Cheese which is adds a garlicky kick and takes your quiche game to the next level. Gluten Free, Vegan, Soya Free and Sugar Free. 1. Begin by combining the dry ingredients for your pastry in a bowl. Add the butter and using a fork mash it in until you get something resembling breadcrumbs. Add the water and using a wooden spoon stir until your dough begins to stick together and you are left with a ball. Wrap in cling film and pop it in the fridge for half an hour at least. 2. Slice your onions and add a saucepan on low/medium heat with the Extra Virgin Olive Oil, pop the lid on. After 5 mins stir in 2 teaspoons of apple cider vinegar. Leave the onions with the lid on for at least 40 minutes until they are very juicy and relaxed. 3. Whilst you wait for the onions. For the filling combine the gram flour, xantham gum, salt, pepper nutmeg and nutritional yeast flakes in a bowl add a little of the non-dairy milk and mix to make a paste before adding the rest of the milk, and whisk until combined. 4. Taking a peeler, peel your courgette – be careful always peel away from you until you have ribbons with a green edge. 5. Take your pastry out of the fridge and on a flat surface dust a little gram flour and using a rolling pin roll out your pastry. Grease the bottom and sides of your quiche dish (I used a 9 ½ inch pie dish) using your vegan butter and a scrap of greaseproof paper. Carefully place your dough into your tin, press down the sides until you have at least 4 cm of depth. 6. Add your very juicy onions to your quiche making sure they are distributed evenly across your quiche. Slowly and carefully pour your filling into the quiche distributing evenly, I do this by slowly pouring in a circular motion from the edges to the centre covering all your onions. 7. Arrange your courgette ribbons in a circular pattern starting closest to the edge working your way in. 8. Pop in the oven at 180 degrees for 35 minutes. 9. When it comes out of the oven it should look a little like this (see photo) depending on your courgette pattern – now here comes the magic! 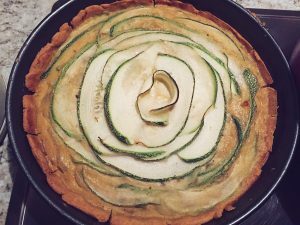 Taking your Raw Food Rosie’s Vampire Slayer cream cheese and a butter knife very gently spread the cheese on top of the quiche leaving the green edges of the courgette showing. Do this gently – take your time. 10. Dust with smoked paprika and pop under the grill on a medium heat for 5 minutes. Slice it, serve it up and enjoy!